PAHOA, Hawaii (AP) — If Hawaii’s Kilauea volcano blows its top in the coming days or weeks, as experts fear, it could hurl ash and boulders the size of refrigerators miles into the air, shutting down airline traffic and endangering lives in all directions, scientists said Thursday. Hawaii Gov. 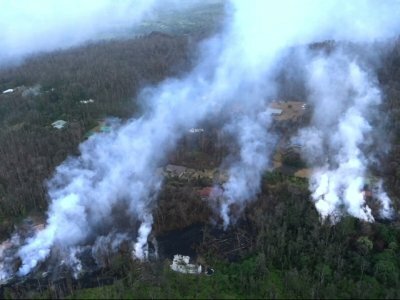 David Ige said crews at a geothermal energy plant near the lava outbreak accelerated the removal of stored flammable fuel as a precaution. The Puna Geothermal Venture plant has about 50,000 gallons (189,270 liters) of pentane. It was removed early Thursday. Officials don’t expect a possible explosion to be deadly as long as people stay out of the closed park. Communities a mile or two (kilometers) away may be showered by pea-size fragments or dusted with nontoxic ash, said Tina Neal, scientist-in-charge at the Hawaii Volcano Observatory. Once the lava drops, rocks that had been superheated could fall into the lava tube. And once the lava drops below the water table, water hits rocks that are as hot as almost 2,200 degrees (1,200 degrees Celsius) and flashes into steam. When the water hits the lava, it also steams. And the dropped rocks hold that steam in until it blows. A similar 1924 explosion threw pulverized rock, ash and steam as high as 5.4 miles into the sky, (9 kilometers) for a couple of weeks. If another blast happens, the danger zone could extend about 3 miles (5 kilometers) around the summit, land all inside the national park, Mandeville said. The small, aptly named town of Volcano, Hawaii, population 2,500, is about 3 miles (4.83 kilometers) from the summit. Janet Coney is office manager of the Kilauea Lodge, an inn and restaurant. She said USGS officials told her lodge employees probably won’t have to worry about rocks raining down on them, but they might experience falling ash. Borenstein reported from Washington, D.C. Associated Press writers Audrey McAvoy, Caleb Jones, Haven Daley and Jennifer Sinco Kelleher contributed to this report.